On Saturday 25th November we held our 2017 Autumn Seminar, Voices of Refugee Women. Our aim for the day was to show solidarity with refugee women and raise awareness of what life is really like for refugee women in the UK. Over the morning session, our executive committee members Marie Lyse Numhosa and Taniel chaired the morning session most sensitively and efficiently (a rare combination). 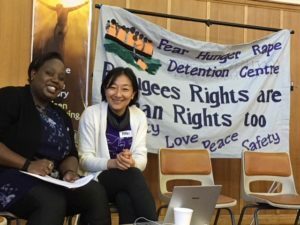 Ten refugee women, supported women from refugee organisations, spoke about their experiences. Our first speaker described the general process of arriving in UK as a refugee. She told us how the hardest part to handle is being the recipient of a ‘culture of disbelief’ espoused by officials from Home Office, and how there is absolutely no support for the women on arrival in UK or advice on how to present their case to start the application for asylum. Our second, spoke of her traumatic experiences of being not believed and trying to survive as homeless woman on the streets. The third woman to speak, spoke about surviving since 2006 as a woman without documents. She described the effects of ‘hiding’ herself from everyone – she dare not tell people who she really is. The fourth, detailed the indignity of being an ‘asylum seeker’. She had a good job prior to entering UK and wanted to work here. She originally took a post earning £38,000 a year but when authorities found out, she was detained, ‘imprisoned’ and had to work for £1 a week. She felt exploited all over again, this time by capitalist practice. Our fifth speaker, talked about suffering racist abuse in her own country. After entering UK, she then experienced domestic violence from her husband and became mentally ill. She would like to see UK policies changed to prevent destitution of those seeking asylum. The sixth refugee woman to talk, told us how she become a refugee because of her resistance to a dictator whose corrupt government was propped up by western governments. She has to exist on £36 a week and has been denied access to health care. She told us, however, that she really appreciates signs saying “Refugees welcome here”. Our seventh, recalled how she was kidnapped and found herself moving from country to country. She eventually had to marry for protection. In time, the government of the country where she was staying gave her money, paradoxically making her more vulnerable, to return to Africa, where she was abused again. She still today is separated from her son, as she could take her son on the journey to UK for fear that he would get hurt. The eighth woman to speak spoke more about the conditions facing refugee women. Telling us how normal ransom demanded from families for kidnapped women is $50,000 – these kidnappers telephone families so that they can hear their relative being tortured to make sure they receive their money. Our ninth woman could not speak English, and so another spoke on her behalf. It was expressed how without hope she was, but still wanted to be present today to witness to hardships and sadness faced by refugees. Our next speaker now works for an NGO, and supports other refugee women. She told us how Europe cannot admit to its Imperial past, and how today’s refugee crisis is a product of our history. Britain is not a Pillar of Human Rights – despite all the propaganda in the UK and abroad that we support a policy of Human Rights. Rather it supports a cycle of destitution, detention and despair – with women left for 10-15 years without papers. She urged us to campaign for refugee rights. Our final speaker fled Africa because of her sexuality. She told us how once in UK you fear being sent back. She detailed how women suffer the pain of separation from their children – but how the Government consistently refuses to allow children in as they refuse to believe women. Women only become ‘refugee’ after spending years in limbo. From the women’s testimonies it was highlighted how women seeking asylum have great difficulty in understanding how to present their own case. If they want to appeal against deportation they have to gather enough information to convince a lawyer that they have at least 50% chance of success, before they can qualify for legal aid. Furthermore, Women for Refugee Women, one of the refugee women NGOs invited on the day, underlined how policy needs to change. They urged us to attend a mass lobby at Westminster 8 March 2018, and to contact our MPs to tell them what is happening to people who have come to UK to seek sanctuary. Jenny Engledow, our Brighton branch secretary, then thanked the women for sharing their experiences and praised their bravery in speaking out. She apologised for the fact that UK government policy toward asylum seekers is built around fear. She said that WILPF women are ashamed of their government’s treatment of these women and all refugees, and hoped that after today’s seminar UK WILPF women would have learned about what they could do practically to help. It was then time for lunch, and we were treated to a performance by the choir ‘Raised Voices’, which sang songs dedicated to the plight of refugees and encouraged us all to join in. Cynthia Cockburn, a longstanding WILPF member has regained some of her unquenchable spirit! We then moved on to our afternoon session. In contrast, this aimed to offer an opportunity for all participants to consider a range of actions that can be taken to tackle injustice many ‘refugee women’ experienced. Breaking up into small groups, each group was asked to discuss one of the four questions. 1) In what sense the issue of ‘refugee crisis’ is a ‘European Crisis’? What action can the UK government take at the European level? 2) Refugees and asylum seekers’ rights are Human Rights. What changes would you like to see to protect them, nationally and internationally? 3) What are the state responsibilities in the protection of refugees and asylum seekers’ rights? Please give examples. 4) What measures are needed in creating the environment and monitoring safe/voluntary repatriation for refugees? Near the end, Renee, a WILPF member, stood up and thanked the refugee women for sharing their stories. Poignantly, she then recalled how she too had been a refugee too once, coming over to the UK to seek sanctuary as a kinder-child. Throughout the day, there was a shared understanding that the ‘refugee crisis’ is a problem of the Global North and those people who seek refuge in Europe after fleeing conflict areas and violence should not be stigmatised or blamed. And by the end of the day, participants were all in agreement about the importance of solidarity and different groups working together to make changes.